The issue appears to be with manufacturers box ! Sorry but will take time, Simply turn off manufacturing box and look into this later. So this one? Looks to be linked to the search bar in header! Sorry but for now simply turn off and look into this later. Oh by the way I am using one page as benchmark for all changes! Some changes are site wide but some are page specific. Now to look at the worst performer Progressive Web App! So missing theme-color tag? An easy fix just make sure the main theme color ( typically your header) on your site is also in your manifest.json file and template_top all match! We get another small improvement. 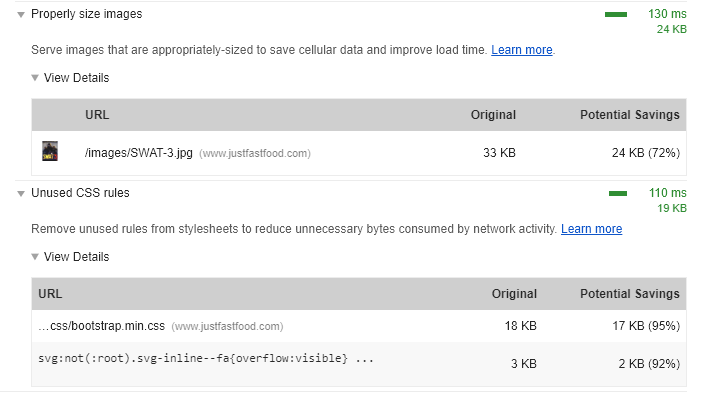 Simply change icons size in manifest.json to 512px. Well that's a pain, got rid of part of the problem but no improvement! Going to put this on hold as I’m not sure its relevant to OcS? Also ignoring this as its the same error we had earlier. I believe this is to do with software that is capable of being used offline on mobile devices when you have no signal. You can down load a App version which you can use with no signal and when signal is available is just connects and updates with your device. 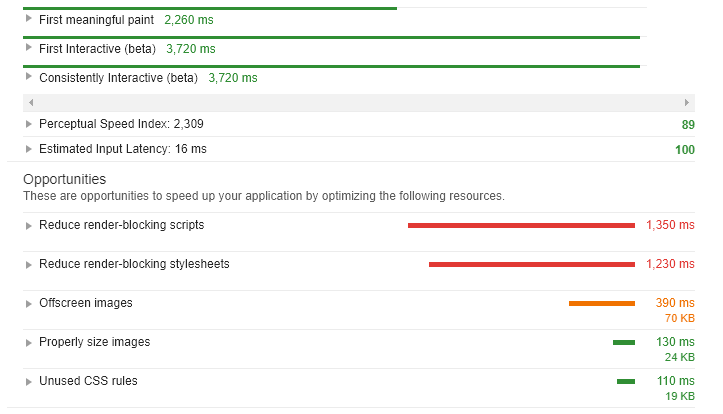 So lets take a closer look at performance. This is not critical! As was mentioned by Gary before its all to do with device speed and type of connection. This is one for the experts! As its not something that can be done as a patch. Basically if an image is off screen then don't bother loading it. Only load those images that can be seen. For stylesheets, consider splitting up your styles into different files, organized by media query, and then adding a media attribute to each stylesheet link. When loading a page, the browser only blocks the first paint to retrieve the stylesheets that match the user's device. See Render-Blocking CSS to learn more. Not a lot I/we can do with this so lets move on and let the experts work on this. Same answer as previous error for this one. So properly size images, Well as it says make sure all your images are the right size for the container you are displaying them in. Resizing on the fly is not recommended (the only exception is vector images). 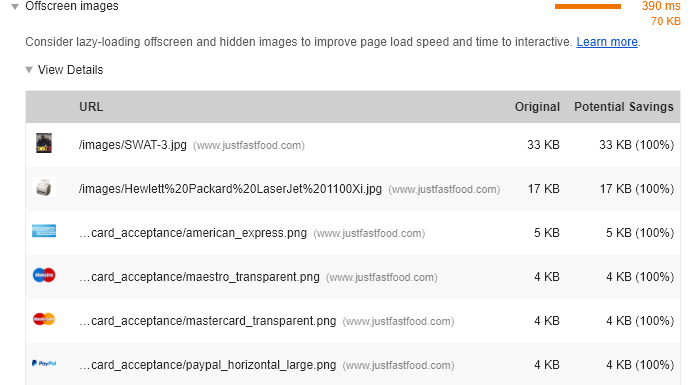 So if you want to display a 800x600 image make sure that is the size of your image and container. Google recommends having the right size image for each device you are going to display on. No point having a 2000x2000 image and showing it on a 200x200 container! Another one best left to the team as its nothing critical. So this is the best I could do. I hope this shows that with a little time you can make small improvements to the stock install which is very good to start with. Please don't think you have to do any off this. For the average shop owner your time is best spent getting good content onto your website. Thank you very much Zahid for taking the time and analyzing each case. I hope this analysis is used positively to improve OSC !!! What does the Manifest file actually "do". In other words, who uses it and for what? Sorry I moved on when I found it was not relevant unless you plan to have a OsC app available. Its basically the file that holds all the info to allow the app to be added to the home screen. 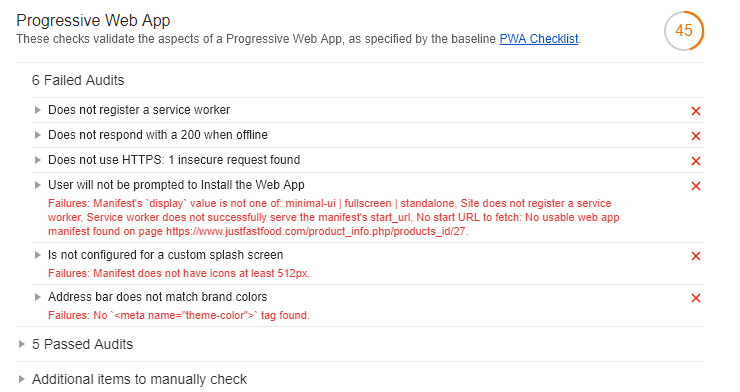 The web app manifest is a simple JSON file that tells the browser about your web application and how it should behave when 'installed' on the users mobile device or desktop. Having a manifest is required by Chrome to show the Add to Home Screen prompt. A simple android app to give you a icon which will take you directly to the test website. Just install on any android phone. The defer attribute is only for external scripts (should only be used if the src attribute is present). however make sure you are not deferring anything critical to page load. osCommerce is not a Progressive Web App so this is totally unnecessary. I've been away for a week with no internet but just caught up on this, good work.